Video Contest WIN DONATE POINTS!!! 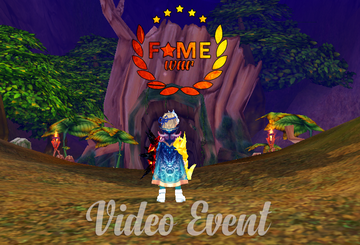 You are here » Fame-War Official Forum » Events » Video Contest WIN DONATE POINTS!!! We need some good Videos to Advertise our Server. And now you guys can help us by creating our Advertisement Video! Of course not for free, you have the Chance of Winning DPs. Each submission will get a chance of winning donate points and by the following stats you can see how much you will be able to win. You will get donate points based on the amount of views your video gets. 100 views : 50 dp's. 400 views : 325 dp's. and every video with more then 1500 views will get 2000 dp's! along side this the staff will choose the best video and it will get rewarded with an additional 1000 DP! What do you need to include in the video? The video is made for advertisement for the server. The video should be minimum 720p Full HD, 1080p Full HD prefered. In the video you need to show off our main features, Systems, shops and so on what ever you think that should be in the video for others to see. Do what you think is best for advertising a server in your opinion. here are some examples of video's of how it should look like. Good luck event will last until 17-8-2017.
also change the name of your video into Fame-War Promotion video gets you more viewers. Very nice videos so far! Try to show as much systems as possible. You will find our features at our website. Well yea, my bad. I added the rates in my title so i think that would also help. Thanks! My views is stuck aahha so sad. Yukio/Yukia here first try to make video editing hope you like it thanks! Yukio it is not bad for your first one. Download the programm : Filmora , it is a very easy drag and drop programm to make videos and saves you some time. Then you got your vid for free with no sign with it. Hi guys ! Maybe i could also include this in my entry . This is just a 1 minute video. But if this suffice your tastes then that would be great. My short but nice entry by far! Couls have shown a bit more of our systems like daily rewards, skandria, crystal meteo, weapon rank etc. Very nice i like it a lot! But guys be carefull what kind of music you choose, this video is blocked in germany for example, because of music copyright/GEMA. Well the video is a bit too long tho. It shouldnt exeed the 3-5mins range. And the trial version is a bit annoying. And always make sure to post the website link in your description. Really? damn, should i replace it? Hope you like it thanks! My entry. Yung do you rly think you get dps for your boosted 1,9k views ? Hahahaha never.